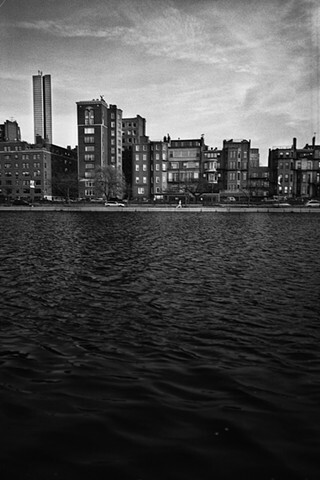 "Lone Jogger, Charles River Esplanade, Boston"
This image was made on Patriots Day, a year after the Marathon Bombing. This place was my favorite escape while a student at Emerson. For how central this portion of the Charles is to the greater Boston/Cambridge area it is remarkably serine. Small sailing vessels, the crews of universities, the occasional rattle of a Red-Line T, the small bands of college students having a laugh in sunshine uncut by the humble yet dominant skyline of Boston's financial district. From the river's edge I could listen to games at Fenway while looking at the Great Dome of MIT and wonder what it would have been like to have seen a VW up there. But mostly it's a quiet place, a calm place, a place where a lone jogger could run for themselves even with the Boston Marathon happening just six blocks away.